The song that The Miserable Rich has chosen for the B-side of their single was one of the biggest Christmas hits of the early 1980s. Featured as side A on a 7” of Southampton singer/songwriter Jona Lewie, and issued on the Stiff Label, the single reached number 3 in the UK Singles Chart in December 1980. Hadn't it been for John Lennon being shot on December 8, the single had probably been a genuine Christmas number one, as it were two John Lennon reissues that keept the song from the number 1 spot. The single was issued in many other countries and reached the Top 10 in a total of 11 countries, among these The Netherlands and Germany and the Top 3 in Australia. It didn't chart in the USA, though. Jona Lewie, whose real name was John Lewis, was not exactly a newcomer to music when he scored his biggest hit with 'Stop The Cavalry'. In the late 1960s, he was active as a blues and boogie singer and piano player, and he contributed compositions and recordings to various compilations. Jona joined the blues band Brett Marvin and the Thunderbolts in 1969 and a vocalist and pianist, and stayed with them until 1973, in the proces scoring a few hits, of which one, 'Seaside Shuffle', a Lewie composition, released by the band under the name of Terry Dactyl and The Dinosaurs, reached number 2 in the UK Chart. Jona Lewie recorded some solo singles between 1974 and 1976 for Sonet, played in the shortlived band The Jive Bombers and some succes in Europe with solo singles 'Cherry Ring' and 'Come Away''. In 1977, Lewie signed to Stiff Records. His first hit for Stiff was humorous synthpop number, 'You'll Always Find Me In The Kitchen At Parties', co-written by fellow Brett Marvin member Keef Trouble. 'Stop The Cavalry' was his next hit for Stiff. The single had the non-Christmas song 'Laughing Tonight' on the B-side. Although the song was not intended as a Christmas song, but as a anti-war protest song, Stiff decided to release it as a Christmas single in November 1980 (as Buy 104). The line 'Wish I was at home for Christmas' and the brass band arrangements gave it a Christmas feeling, and the fact that the song did so well in the charts in December 1980 proved the label right. The song starts out with a reference to Winston Churchill, and in the first few lines seems to be about a soldier in a winter during the second world war. But the references in the rest of the song make it more a universal song, not located at a specific moment in time. Most clear in 'I had to fight, almost every night – Down throughout these centuries', while the title of the song, repeated several times at the end of most couplet, is as reference to pre-20st century wars. Jona Lewie himself later described the song's soldier as being "a bit like the eternal soldier at the Arc de Triomphe". The line 'Mary Bradley waits at home – In the nuclear fall out zone' does make the song a very much early 1980s song. The fear of a nuclear war was everpresent in the early 1980s, while it is commonly believed that Mary Bradley refers to the London male transvestite prostitute and traversite Martin Bradley, who used to hang out in pubs and clubs in the South London of the 1970s and 1980s. Who Luzar and Jim are, who have tea when another bomb falls on another town, is less clear, nor why Mary Bradley had to wait two years. Maybe Jona Lewie will once reveal these secrets. As for the music, it is believed that the song's melody is loosely based on a theme from Swedish Rhapsody No. 1 (also known as Midsommarvaka), written by Hugo Alfvén in 1903, while other parts of the song bear a resemblance to Mozart's Rondo in D Major, K382. The song had been such a big hit, that Stiff decided to release another version of the song a year later. This version was sung by the Gwalia Singer, a Welsh male voice choir, who were accompanied by the Cory Band. Unfortunately for the label, that version of the song did not chart. 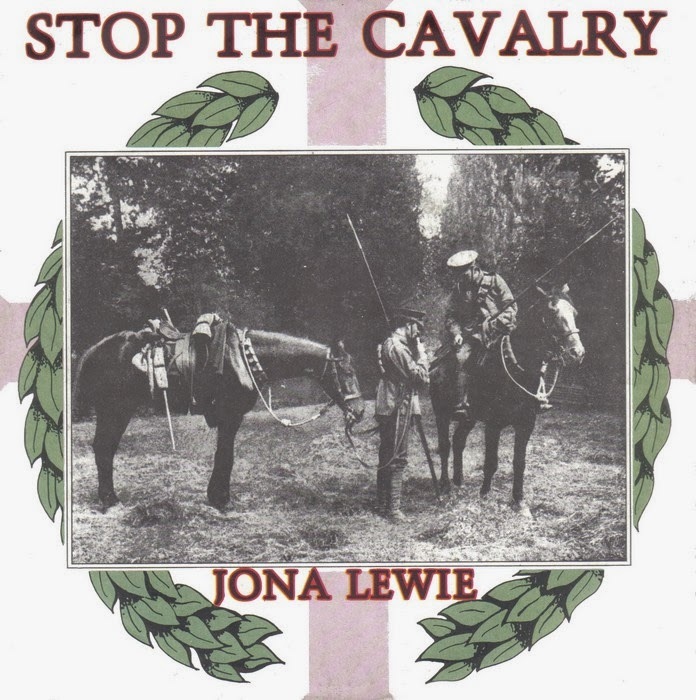 Over the years, 'Stop The Cavalry' has become a real Christmas standard, which is funny when you know that it was never intended as a Christmas song in the first place.